Venice Shuttle is a fast, cheap and exclusive shared boat service, from every terminal to Venice centre. Passengers will experience the pleasure of traveling on our water taxi admiring Venice, comfortably and quickly reach their hotels. Our shared water taxi service leaves from by all terminals of Venice: Marco Polo Airport, Cruise Terminal, Piazzale Roma, Tronchetto Car Park, Railway Station 'Santa Lucia'. Venice Shuttle allows you to get anywhere in the city center to avoid the overcrowding of public transport and the long lines at the checkout, at cheap rate. The transfer is operated by shared water taxi. You can reserve online for minimum 2 people. WHEN IT WORKS: every day for arrival from 8.00 to 22.30 with different stops if necessary. For late evening (after 20.00) arrival a 6 euro extra fee will be applied. WAITING TIME: since your arrival at the desk in the Airport hall you may have to wait from 20 up to 45 minutes. ATTENTION: The shared transfer service doesn't stop at Hotel JW Marriott and Hotel Excelsior, neither connect directly Marco Polo Airport with Cruise Terminal. We remember you, in order to make our service better and more specific, that you must enter a phone number to find and communicate any delays longer than 10 minutes. 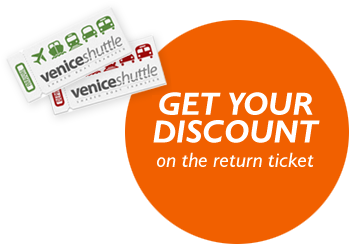 GET DISCOUNT if you buy VENICE SHUTTLE IN and VENICE SHUTTLE OUT on the same order. Passengers and price: a part from all private transfers the Venice Shuttle price is intended per person. Please fill in the Quantity item with the number of person you need to transfer. Children up to the age of 6 years travel for free. ATTENTION: The shared transfer service doesn't stop at Hotel JW Marriott, Hotel Excelsior, neither connect directly Marco Polo Airport with Cruise Terminal. The service is reservable for minimum 2 people. However, if you're travelling alone and are interested to book an Venice Shuttle water taxi, have to pay at least 50 euro like a two people service reservation or your request won't be accepted. If you need to buy also the return transfer from your hotel you have to buy the Venice Shuttle OUT service, also in the same reservation.